Recently got the chance to try this tea from the Republic of Tea. I found it to smell much stronger than it tasted. The coconut smell was so strong it made you think of an almond joy! However, I found the actual tea taste, which I tried hot, as a pretty weak tea. 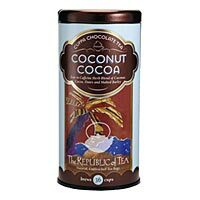 Inlook forward to trying some of their other chocolate teas.